Your garden is beautiful, Donna! I love the feeder! I can almost smell the Honeysuckle! Donna, you have such beautiful gardens. Our neighbour has honeysuckle and I love to see the hummingbirds it attracts. Girl, your garden is gorgeous..
beautiful flowers and garden donna. 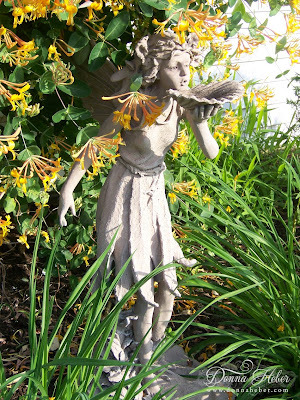 love your stone sculpture she is gorgeous. 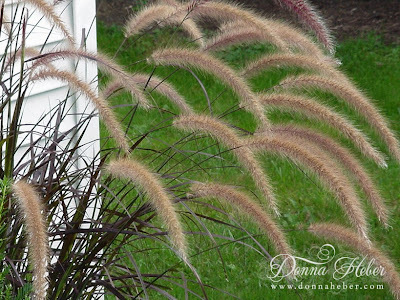 The fountain grass is so delicate and graceful. Thanks for the comment on Father's Day.Thanks for sharing. 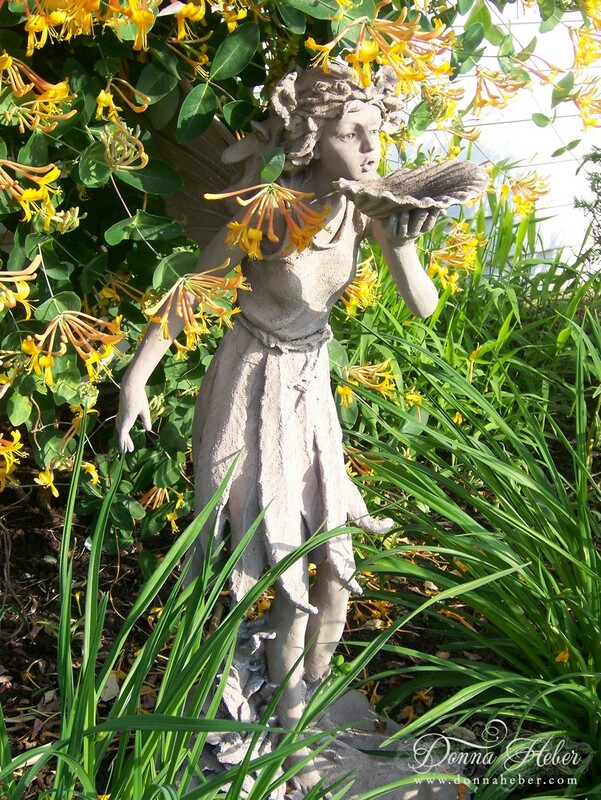 Donna, love your plants but have to admit, your precious fairy girl stole the picture! You have such an amazing eye for gardens and art! What a beautiful Garden. I love the smell of Honeysuckle.. Your Statue is beautiful! I've never grown honeysuckle but can almost smell the scent of yours from my screen. I like the fairy statue, a nice big one too. I always enjoying looking at your flowers. 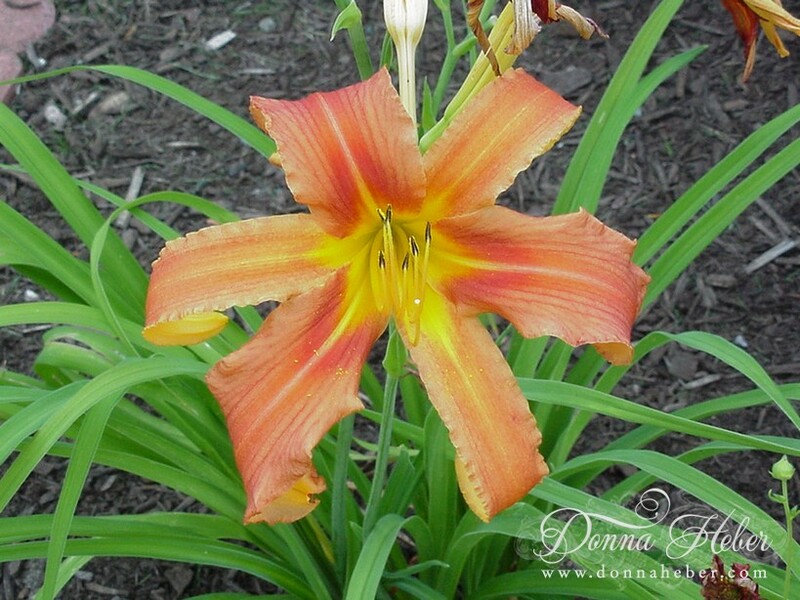 I love that type of Daylily. Beautiful. I really like your garden statue. 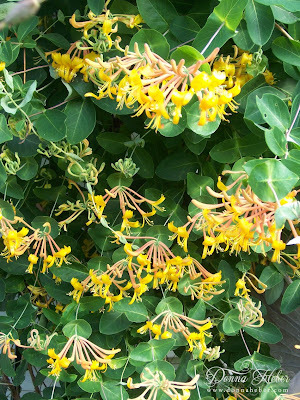 The honeysuckle vine is quite lovely. I don't think we can grow them in Michigan...at least I never have had one. I bet they smell divine. Beatuiful combination ..... love the little girl peeking out from the blossoms. 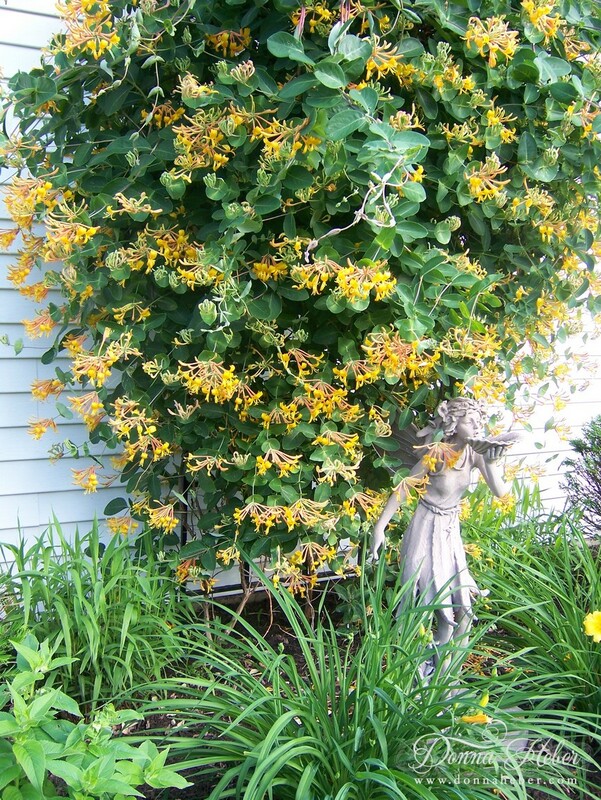 What a beautiful honeysuckle vine! Gorgeous! Lovely gardens. I love the statue there, she really fits. I've always loved purple fountain grass. I love how it droops and blows in the wind. Your honeysuckle is full of blooms! I'm excited that the daylilies are starting to bloom. That's a pretty one. Love your fairy and the honeysuckle looks fabulous! I bet it smells awesome! Everything looks beautiful! 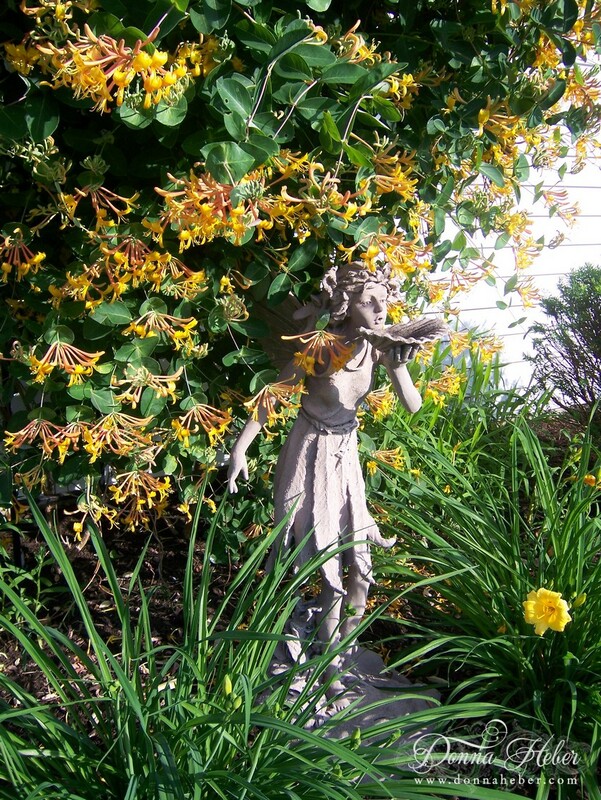 It will be a little while longer before my lilies are blooming. Love the honeysuckle! Doesn't it smell fabulous! Thanks for stopping by my blog! Beautiful garden Donna! I see where you get some of the inspiration for your cards - you're surrounded by such beauty! TFS these lovely photos of your beautiful garden! beautiful garden! wish I have a green thumb to grow a garden like that. Especially love the purple fountain grass. Everything is beautiful there. Love the bird feeder as I am sure the birds do. I can hear their little wings flapping and smell the lovely fragrance too! I can smell the honeysuckle by just looking at your pictures. I have a similar honeysuckle on my arbor and we had a catbird build its nest on the arbor amongst the honeysuckle branches. Right now my trumpet flower has blooms that the hummingbirds just love. Adore your fairy bird feeder.